Lake Michigan beaches, like this one in Bay View, aren't strangers to litter. Todd Brennan holds up a piece of shotgun wadding from a debris pile of beach trash from a Lake Michigan Beach. Lake Effect's Ben Binversie and Gabrielle Powell learn where the trash that ends up on the shores of Lake Michigan comes from. This week on Bubbler Talk — our series that allows you to ask WUWM questions about Milwaukee — we headed to the beach with Marla to talk trash with Todd Brennan, a senior policy manager with the Alliance for the Great Lakes. To get a firsthand idea of what’s washing up on the shores of Lake Michigan, we took a walk along Marla’s stretch of the beach. 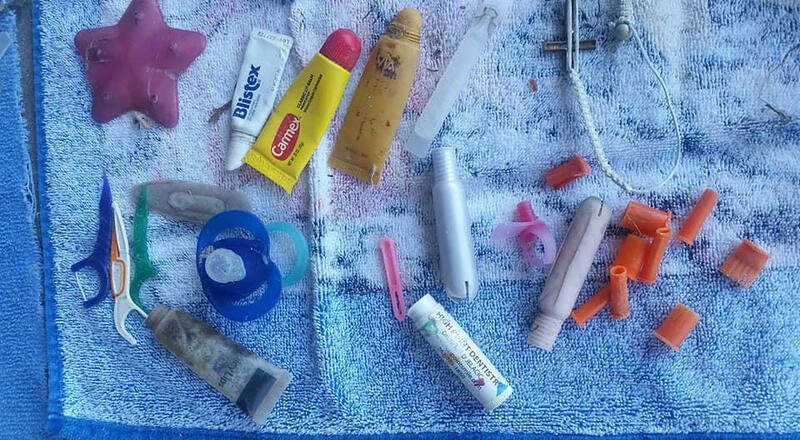 In just one debris pile, we found: shotgun wadding, a syringe and needle, cigar tips, bottle caps, floss, a fake plant, and a hair tie. The list goes on. While exploring the beach, we found an inflatable buoy from the Milwaukee air show that washed ashore. A little too big for Marla Schmidt's bucket, but she pulls it in and we take care of it nonetheless. “Cigar tips are actually in the top 10 list of ‘most found’ items on the beaches. About 10 years ago, they came onto the top 10 list, and they never left,” says Todd. In fact, there are so many plastic cigar tips that Marla ends up ignoring cigarette butts. But Todd reminded us that, even though they may look like paper, they’re not. Marla Schmidt's collection of cigar tips from cleaning the beaches this summer. “Cigarettes are actually acetate, so that is plastic, and there’s lots of chemicals that are located inside. I think that’s a problem people don’t realize. They think it’s cotton, that it’s biodegradable — it’s not,” he says. According to Todd, about 85 percent of Great Lakes beach litter is plastic, and we certainly found our fair share on the beach. “There’s [sic] probably thousands of pieces of plastic in a two meter-squared spot,” he says. Now to answer Marla’s question: where does the trash come from? “It’s kind of a mixed bag,” Todd says. A significant portion of ocean waste comes from ships. But, he says, the waste on Lake Michigan’s shores comes mostly from land activity. He says, “It’s a shoreline issue … which is just, sort of, our issue, meaning the people, as we conduct ourselves in the city." So, the responsibility is on us, as citizens and stewards of the Lake, to keep the beaches clean. But Marla says beach cleanups won’t solve everything. Marla Schmidt cleans up garbage on a beach along Lake Michigan. And that’s not hyperbole. A 2017 study by the Rochester Institute of Technology estimates that about 21.8 million pounds of trash enter the Great Lakes each year. About 10 million pounds end up in Lake Michigan. That's about 100 Olympic-sized pools full of plastic water bottles. Garbage is an eyesore, sure, but what’s the impact of all that waste? “Plastic never goes away, it just gets smaller and smaller," Todd says. "It gets degraded by the sun, which makes it even more insidious because it becomes part of the food web. It’s part of our water system." Of potentially greater concern than the plastics themselves, though, are persistent organic pollutants, or POPs. They include pesticides, industrial chemicals, and other byproducts that have been recognized as having adverse effects on humans and the ecosystem. The concern, Todd says, is that these chemicals could adhere to plastics and end up in the stomachs of wildlife, or humans. Although research is still ongoing about the consequences of these chemicals and micro plastics in general, he says the concern is legitimate. Marla Schmidt finds a lot of plastic on a Bay View beach along Lake Michigan. “Wildlife need [water] and so do we. We survive on this water,” he says. So, while beach cleanups are important, Marla and organizations like Alliance for the Great Lakes want to address the root of the problem by changing consumer behavior to prevent the plastic from getting to the beach in the first place. Through her own work, Marla helps people become more sustainable in their consumption, and seeks to support businesses making an effort toward sustainable practices. Take, for example, the recent surge in plastic straw bans across the country. Here in Milwaukee, plastic straws are not banned, but many businesses now offer paper straws or only provide plastic straws upon request. 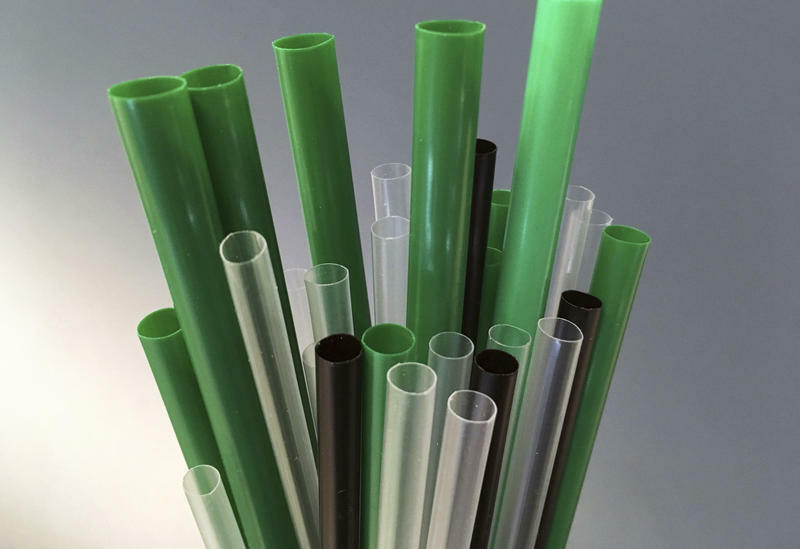 Oshkosh-based paper company Hoffmaster recently acquired the only paper straw company, Aardvark. 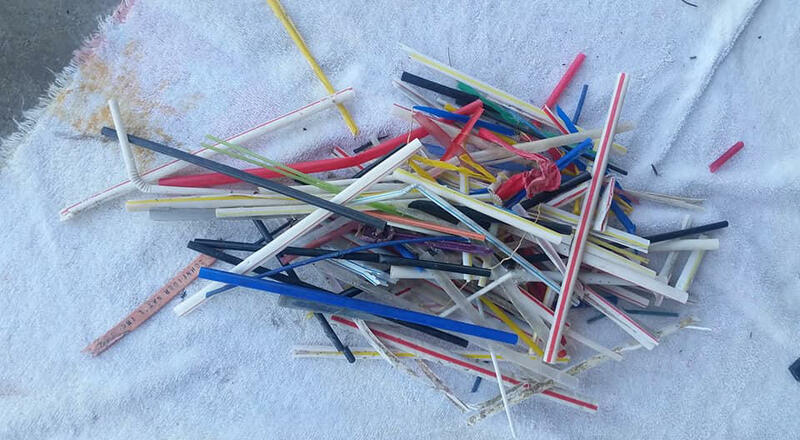 Plastic straws Marla Schmidt found while picking up trash on a Lake Michigan beach. Although straws may seem like an insignificant part of the 21.8 million pounds of annual trash accumulation in Lake Michigan, Marla says it makes a difference. “It’s only one straw … said 1 billion people,” she says. No matter where beach trash comes from, we know who it comes from. We share the responsibility and we must share in the solution as well, says Marla. Gross. Annoying. Ugly. But, illegal? This week, WUWM's Bubbler Talk answers the question: Is littering by throwing cigarette butts legal in Milwaukee?